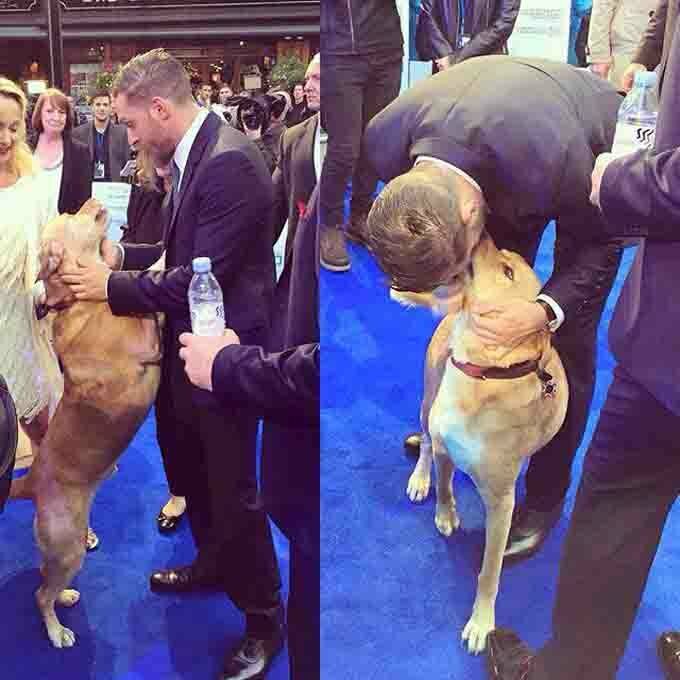 Actor Tom Hardy brought an honored guest to the red carpet at the premier of his new movie Legend. His dog, Woody, stole the spotlight as he rubbed shoulders with actors and celebrities, and even wiggled his way into one of Hardy’s interviews by jumping up for some attention. The pup was looking extra fashionable in his bow tie, but threw decorum to the wind when a wayward pigeon landed nearby. Woody wasn’t about to be upstaged by a bird and chased the feathered intruder off, nearly taking off its tail in the process. The pooch was happy to photobomb some fan selfies with his actor owner, as well. Eventually Woody calmed down and sat politely for some pictures with his family. He’ll have to share some of that attention as Hardy and his wife, Charlotte Riley, are expecting their first child. But he’s certainly prepared to defend the new baby from any pigeon attacks.